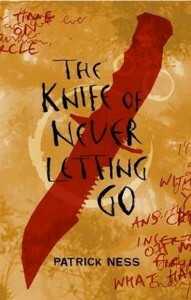 The Knife of Never Letting Go starts with Todd. He's 30 days from his 13th birthday and in his colony of Prentisstown, that means he will be a man. As the youngest person in his town he wants to be accepted with everyone else. There are no women in town and everyone can hear each other's thoughts. They came to the planet before he was born and warred with the native alien race, resulting in the death of all the women and the aforementioned ability to read everyone's thoughts. However a series of events forces Todd to leave and venture out in to the rest of the planet, where he finds that most of what he knows was a lie. I liked the book overall. The writing style was a bit annoying in that it was a stream of consciousness and he is uneducated so there were many spelling errors. I think I'll continue the series at one point.